We provide visualizations of how likely it is you’ll be able to take each rookie at each rookie draft pick. 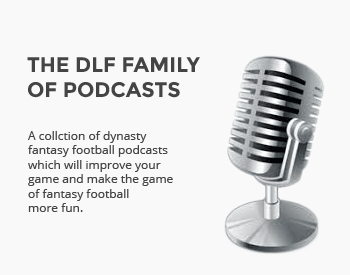 Dynasty League Football is home to a plethora of tools and resources for dynasty owners to utilize and leverage. One of many, though one perhaps most recognized, is Average Draft Position (ADP). Specifically, every month DLF’s Ryan McDowell puts together ten rookie mock drafts in order to gauge community consensus on potential real rookie drafts. Rookie draft ADP is certainly useful, but we all know that every rookie draft is different. Just because a rookie has an ADP of 4.3 does not mean he will be available even at the 1.03 pick in every rookie draft. Utilizing the actual results from all ten rookie mock drafts, we can actually chart out the likelihood of a prospect being available at each and every rookie pick. I’ve been digesting rookie ADP this way for several months, and it seems the community enjoys this methodology. While I have been posting these visualizations for the first round only, as a DLF subscriber you have access to the results all rounds of rookie mock drafts. In this article series, we’ll go through each round and highlight key takeaways for each. Before we begin, it’s important to quickly note that although ten mock drafts are a lot to draw conclusions from, it’s certainly not all-encompassing. You’ll find that many players have a “100%” or “0%” of being available at certain picks. This, of course, is not entirely true, but this exercise is incredibly valuable nonetheless. The results of these mock drafts are just a small microcosm of the community as a whole. We can expect the actual probabilities to be similar, though not exact, to the ones presented here. Without further delay, let’s begin! Very helpful. Thank you Michael. I like this approach to using ADP. That being said, I find it a bit misleading at this point in time. Most people will draft rookies following the NFL draft. There’s so much potential variance in value due to landing spots this year. For example, there’s a good chance that Harry ends up somewhere worse than two other WRs and will end up being consistently available at the 1.03. Great template but it’s too much of a guessing game right now to use it fruitfully for me. This is fantastic. Please do one once the dust has settled after the NFL draft! While useful, I’m a little skeptical. If your using the same 10 mockers every month then their rankings are likely to not vary much. A much larger pool of drafts may have a larger variance. Just based on past drafts in my leagues, with the same rules, I’ve seen numerous players go 1 or more rounds (not just picks) different +/- from ADP’s. Add in leagues that allow free agents and that skews things even more. Best advice is, if the player you really want is available at your pick, go ahead and take them. Don’t let the few or 10 😉 sway your opinion.